The Campfire Tossed For Ideas? Here Are Some Easy Salads You Can Make On The Road! Tossed For Ideas? Here Are Some Easy Salads You Can Make On The Road! You may have a love for cooking but let’s face it, sometimes it can get a bit tricky on the road! You simply can’t go past a classic salad as a side dish to fill your belly-plus, it’s super easy! 1 x punnet of cherry tomatoes. 1 x small tub bocconcini cheese. 1 packet of Italian biscuit bread. Cut cherry tomatoes in halves. Cut cheese into halves or quarters, whichever you prefer. Roughly break up Italian biscuit bread. Cover and refrigerate for 1/2 hour then serve. ¼ cup Castor Sugar or you can use honey. 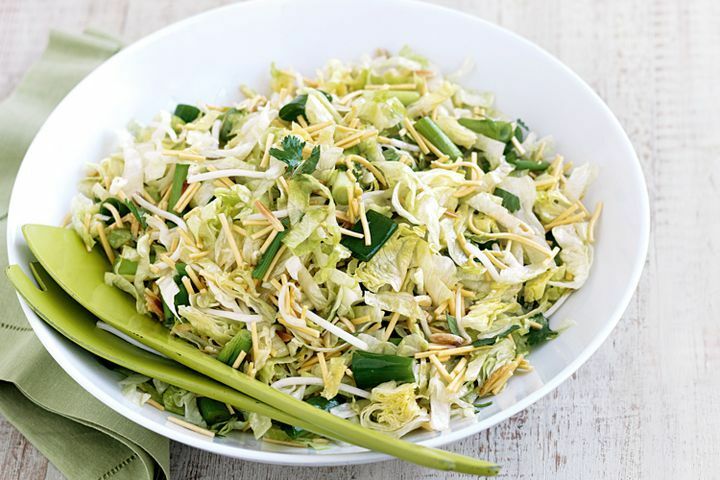 Combine the sliced cabbage, chopped green onions and almonds in a salad bowl.